There’s no mistaking a John Berkey painting; at once realistic, yet impressionistic and abstract, it’s a style uniquely his. It is paradoxical that he should be one of the world’s most renowned science fiction artists – his spaceships distinctly elegant, yet clearly technological and unmistakably Berkian; more inspired by luxury yachts and manta rays than NASA – when he, in his own words, “never cared much about science fiction”. In spite of this, his legacy is inexorably linked with it, and while his direct contribution to Star Wars is considerably less than that of Ralph McQuarrie, Joe Johnston and the many other artists who worked on it, it is nonetheless quite significant if almost unknown, beginning in 1975 when Lucas was first trying to get Star Wars off the ground. [...] George Lucas himself personally called Berkey at his home studio and commissioned him to do several paintings to be used as the visual background to try to get a movie studio interested in funding Star Wars. Though they’ve finally gotten a bit more exposure on the 2011 blu-ray release, Colin Cantwell’s models, much like the man himself, have been woefully under-documented by official sources, and so it’s difficult to say whether the models or the paintings came first — my money is on the models — but whatever the case, Berkey’s painting no doubt served as an initial guide for the Death Star’s early cluttered, distinctly metallic surface. 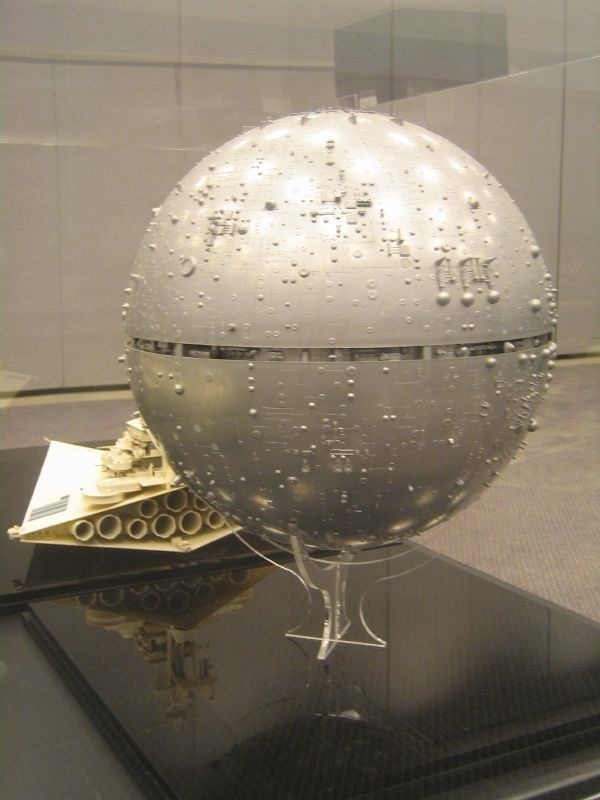 For a man who didn’t care for science fiction, and who indeed did much, if not most of his work outside of the genre, Berkey’s influence on Star Wars was enormous, simply by virtue of having conceptualized the Death Star, one the most powerful symbols to come out of Star Wars period. Though there’s little actual proof to back it up, it’s very likely that the initial naval-look of the Star Destroyers, as well as the off-white color scheme with the blue simple markings on the side, was based off of Berkey’s love of naval-like space craft, which often featured similar antenna-ridden conning towers on top of smooth, though mostly curved, hulls. Orca was released in 1977, so it figures that the film Lucas was working on at the time was probably Star Wars, which filmed on location in Tunisia, and at various studios in England, and during which Lucas fell ill from stress and exhaustion. It’s unclear why Lucas would call Berkey on behalf of Spielberg and Universal, perhaps it was simply as a courtesy? Whatever the case, Orca as a film, the poster image indeed doesn’t have much in common with Jaws at all. During a round of interviews for the John Berkey Observed exhibit in 2005, Berkey professed that he had “yet to see Star Wars. I suppose I should see it one of these days.”spacecase. He died in 2008, age 75. Rod Smith. 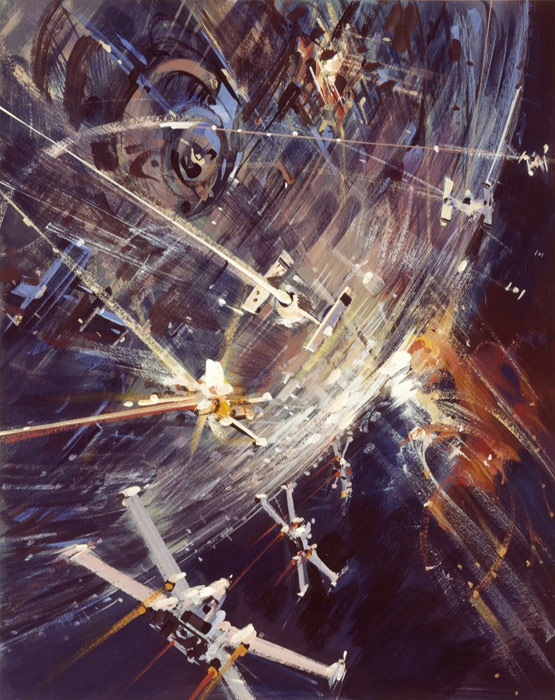 Space Case: John Berkey Paints the Universe. Citypages. November 30, 2005. John Berkey: Tribute to the Master. Accessed August 7th, 2011. Kevin H. Martin. Star Wars Stories. Cinefex #65. Don Shay, March, 1996. Dale Pollock. Skywalking: The Life and Films of George Lucas. Harmony Books, 1983. David Know. The Art of the Poster. MovieMaker, February 4, 2004. Syd Mead didn't work on The Empire Strikes Back, but he made a significant contribution nonetheless, when his designs for US Steel ended up informing the imperial walkers deployed on Hoth.